The Indian Equity Markets continued to rally and went on to scale yet another peak while the benchmark Index NIFTY50 ended the day with a decent gain of 71.50 points or 0.66%. After a tepid start and a range bound trade in the first half of the session, the buoyancy returned once again. While going into trade on Tuesday, we expect the levels of 10880-10900 acting as a strong base. Though a quiet to modestly positive start is expected, there are heightened chances that the Markets encounter consolidation in a defined range while individual stocks continue to out-perform. 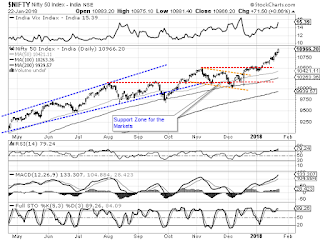 The levels of 10990 and 11075 will act as immediate resistance levels for the Markets. Supports come in at 10900 and 10865 zones. 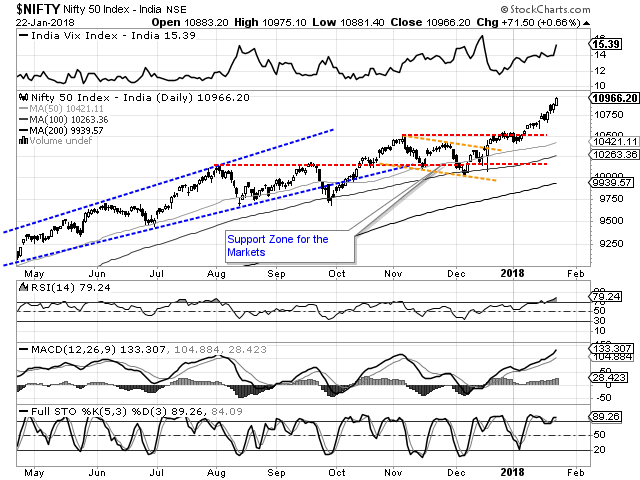 The range of the NIFTY has widened owing to the unabated move on the upside. The Relative Strength Index – RSI on the Daily Chart is 79.2404. It has marked a fresh 14-period high which is bullish. However, it trades in overbought territory. The Daily MACD remains firmly in continuing buy mode and it is bullish while trading above its signal line. The pattern analysis shows the up move remaining firmly in place. The NIFTY has ended in a unchartered territory and has shifted its base much higher at 10490-mark after breaking out above those levels. We have to take note of the fact that the NIFTY now trades much overbought. However, being overbought is a sign of strength and it is no reason to sell. However, it may induce some consolidation at higher levels. The NIFTY has continued to close above the upper Bollinger band and this applies that the current breakout and the up move that we are witnessing may continue. However, given the fact that the Bollinger bands are 45.40% wider-than-normal, there are probabilities of NIFTY returning within a rage in coming days. In any case, this translates into buoyant outlook with limited downsides in the Markets. Some consolidation is expected but it is advised to continue to make purchases while guarding profits at higher levels.